Since Big Finish began producing audio adventures for our favourite Time Lord over a decade ago, they have brought back many of the classic and more obscure monsters from the television series, yet, Heroes of Sontar marks the first time the company have used the Sontarans. Quite why it has taken so long to bring these clone soldiers to audio is baffling considering how much fun this story turns out to be. Heroes of Sontar is the first instalment of the second series of adventures for the Fifth Doctor, Turlough, Tegan and Nyssa, and focuses on a platoon of seven Sontaran troopers being deployed to the Planet Samur; a peaceful haven conquered by the armies of Sontar twenty years earlier. These soldiers have been given sealed orders for a secret mission, sending them into the furthest reaches of Rutan space. Unknown to the Sontarans, the Doctor and his companions have arrived on Sumar too, looking for some rest after Tegan’s latest encounter with the Mara. Eventually, after crash landings and getting separated the travellers and the Sontarans are thrown together, for there is something ancient and deadly hunting in the dark. Let us begin with the stars of the audio, the Sontarans. These are the Sontarans of the classic series. You can hear in the pitch perfect voices the echo of the late Kevin Lindsay as Linx and Styre from adventures gone by. It is thoroughly authentic and one of the great pleasures of this release. What strikes you listening to this play is its rather light approach. The seven Sontarans have very different personalities but all are by the book soldiers and just a little bit thick. Writer Alan Barnes has made no secret that these are the Dad’s Army of the Sontaran Empire and he is not joking. They are all very individual characters with their own quirks, strengths and failings, whether it is Seargant Mezz, an officer driven exclusively by protocol or the incredibly doom laden thoughts of the subtly brilliant character Trooper Jorr. Some listeners may have an issue with the humorous tone of the story, but it is a clever plot device as it becomes quite clear as the story unfolds, there is a much darker reason as to why these Sontarans are so utterly useless. These are Sontarans that we, dare I say it, care about and it is all the richer for it. The performances are all very good indeed. Peter Davison excels as always and Sarah Sutton, as the older Nyssa is wonderful, but a special mention must go to Derek Carlyle who puts in a very touching performance as Trooper Vend. If anything negative can be said about this play is that some of the humour doesn’t quite work. Tegan’s acerbic put downs to the Sontarans become a bit annoying and Turlough has moments of cowardice that seem at odds even with his cowardly personality. The mysterious antagonists could have done with a bit more back story but what we are given is enough to make them work as rather chilling villains. 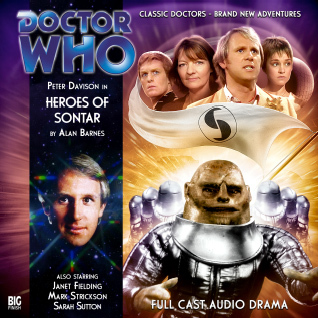 With excellent direction by Ken Bentley and a superb musical score by Jamie Robertson, Heroes of Sontar is a highly recommended debut for the Sontarans at Big Finish and a strong start to the new Fifth Doctor season.